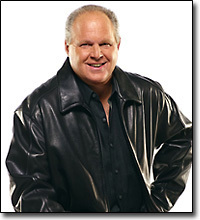 The Rush Limbaugh Show is the most listened to radio talk show in America, broadcast on over 600 radio stations nationwide. It is hosted by America’s Anchorman, Rush Limbaugh, also known as: America’s Truth Detector; the Doctor of Democracy; the Most Dangerous Man in America; the All-Knowing, All-Sensing, All-Everything Maha Rushie; defender of motherhood, protector of fatherhood and an all-around good guy. Tune in to Rush Radio from noon until three, Monday – Friday, on WIBC.